This tutorial describes how to quickly paint a rather nice looking eye in GIMP. Also, it turns out that you can follow rather simple guidelines in order to make a standard, yet pretty good-looking eye. And once you learn it, it will help you a lot when drawing people -- because once you have the eyes down it's much easier to make the rest of the face. There is a full Portrait tutorial [here], but for this tutorial we stay small and fast and concentrate only on the eye. Other tutorial of mine you might want to check out if you are having trouble is my [Setting up GIMP for artistic work (Basic Airbrushing)] tutorial, or for that matter the [Beginning GIMP] tutorial if you are completely new. This tutorial works perfectly to do with a mouse -- that's how I learned this once. A tablet works too of course, but you can definitely use the same technique using normal ink pen and paper -- that's actually great training since you cannot "undo". You will need four tools in GIMP -- the ink pen, the airbrush, the smudge tool and the eraser. You should have [Resizeable brushes] set up properly. We will only use one brush, and that's the hard-edged, round one. We will use one colour from the palette only -- black. If you need to add white, use the eraser to bring forward the background. We will work on one layer only -- a transparent layer on top of the white standard background. It's strongly recommended that you learn the keyboard shortcuts for the various tools. You don't want to move the cursor away from the canvas more than nesessary. Ink pen (shortcut k) -- This you will use to make all outlines. For the sake of this tutorial the ink pen replaces the brush tool for all "opaque" painting (with full black). Set a 45 degree angled round tip, set size to 2.2 and the opacity to 80% . Airbrush (shortcut a) -- This tool is used to create all shades in and around the eye. Note that you don't need to change the colour in the palette to create grey -- just let the opacity of the airbrush work for you. See the [Basic] and [Advanced] airbrushing tutorials on more info on this. Set the opacity of the airbrush to 20% (! ), the rate to 80% and the pressure to 10%. The eraser (shorcut Shift+E) -- This is a very important paint tool in its own right. You will use it to bring forward the white of the image. To make it more nuanced, set the opacity to 80%. An idea is to pause the video repeatedly, to really see what's going on. Hopefully the video is self-explanatory, but here is a quick summary of the steps. Ask in this thread if something is unclear. 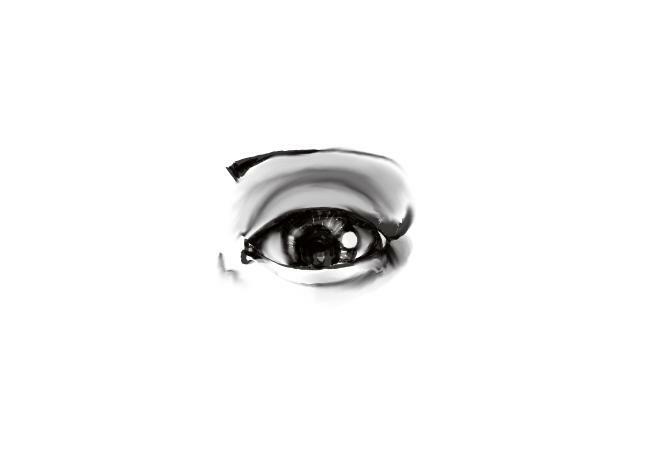 Use the ink tool to sketch the basic structure of the eye. As you can see it's really a rather simple "cliché" eye that we start with. Place the highlights in the eye (you will find I relocate these later). Note how much black I put inside the eye, under the eyelid. This is important for the final effect. Use the airbrush to apply shades around the eyelids and also inside the eye. Use the opacity of the airbrush to get gradients. Use the smudge tool to blend the shades together into smooth gradients. Use the ink and eraser tool to reposition the highlights and adjust it. Smudge the black outlines lines into the shades using the smudge tool. Work in short strokes, along the ink lines, gradually angling off from them to smudge them gradually into the background. Finish off with final checks and adjustments with whatever tools fits best. Hopefully trying this a few times will soon let you have the basic form down. It should make it easy for you to adjust the angles and corners of the eye to make it e.g. male (remove eyelashes) or asian (fold in inner corner of eye) or ... or whatever you want to make. Of course, this is not a perfectly realistic eye, and it was not intended to be. This type of more simplified style works fine for most styles of character art, from concept art to comics (most comics are actually a lot simpler in style than this). But it is certainly not photo-realistic either. If you want super-realism you could easily build from this though, by refining it with finer lines, placing individual eye lashes, reducing the heavy mascara etc. The idea here is to get you going, how far you take it is up to you! I'm looking forward to seeing people try this, it's really a quick doodle that you, with little training, can make look good. It also works very well to do with good old pen and paper.